You've probably discovered making digital pictures isn't as 'point and click' as you thought! You take the time to fiddle with your new digital camera, make a bunch of pics, but then you find they just don't look like what you saw in the monitor - or maybe you want a professional's touch in making your best snaps better. As an award-winning editor, reporter and photographer, I've worked with thousands of digital pictures to cover uses from newspaper and magazine covers to private portraits. It not only takes skill to post-process well; it also takes the ability to see the photograph in the picture. To find out what possible miracles I can perform, all you need to do is send me your ORIGINAL file(s) (Today's high megapixel cameras can mean HUGE files so you might want to use a FREE bulk transfer service, like http://yousendit.com.) with a note about your primary target use. Will it be a large inkjet print or through a bulk printing service like Wal-Mart? Is it for press or another use where superior quality is required? In any event, I'll take a look at what I think can be done with exposure, cropping, target sizing/resolution, colouring, sharpening, softening and noise reduction. I'll email back a low-resolution proof of my edits and if you think that will suit your needs, I'll bill you just CDN$2.50 per picture for the full image. Advanced editing (removing old loves, dropping in new ones, special effects, changing backgrounds, and things like that) will be through your acceptance of a quote. If you require post-processing of many images, I have competitive rates for bulk files and pre-press. 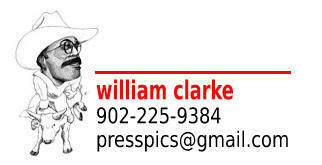 Just email me at presspicsNOJUNK@gmail.com (remove the NOJUNK) with your requirements.